Welcome to the sixth edition of Mini-Reviews. This time, there are more movie reviews than usual. I’ve been a bit behind so this is me making up for lost time. So let’s get to it, shall we? I didn’t think much about the film other than the fact it had a good cast. Ironically, I had that same feeling about Masterminds, which also had Zach Galifianakis, and while Keeping Up with the Joneses was a better movie than Masterminds, the film doesn’t do enough to warrant being a standout action comedy. The film follows Jeff (Galifianakis) and Karen (Fisher) Gaffney, who quietly live in the suburbs. Karen is an interior designer while Jeff works Human Resources for a big company called MBI. However, the lives get turned upside when their new, and seemingly perfect, new neighbors Tim (Hamm) and Natalie (Gadot) Jones turn out to be spies. When the Joneses come clean, the Gaffney’s ended up being sucked into their mission to stop a deadly plot. 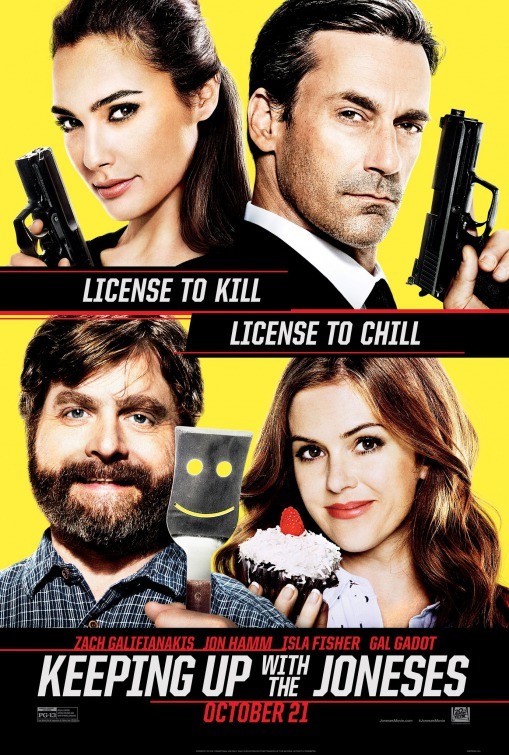 Keeping Up with the Joneses isn’t the best action comedy out, but it certainly isn’t the worst. The cast isn’t that bad and the mismatched casting of Galifianakis and Fisher with Hamm and Gadot actually works, although the bonding scenes and overall chemistry of Galifianakis and Hamm plays out better than Fisher and Gadot. There are some genuine laughs in the film, but overall the film does shoehorn in some jokes that fall completely flat. The film also does rely more on the comedy side of things rather than the action. Although the standout action sequence is a car chase that does feel a bit out of place within the movie, but one that actually works in terms of action. All in all, the film does have a lot of issues, and while many will probably end up forgetting they watched Keeping Up with the Joneses in a few years, it isn’t completely a waste of time like some will have you believe it is. Synopsis: Jack Reacher must uncover the truth behind a major government conspiracy in order to clear his name. On the run as a fugitive from the law, Reacher uncovers a potential secret from his past that could change his life forever. The first Jack Reacher was a pleasant surprise when it came 2012, but when the sequel was announced without director Christopher McQuarrie, fans were, respectfully, disappointed. That being said, the sequel went forward to new director Edward Zwick (Glory, Blood Diamond), who worked with Tom Cruise on The Last Samurai. However, the result this time around was not that great. 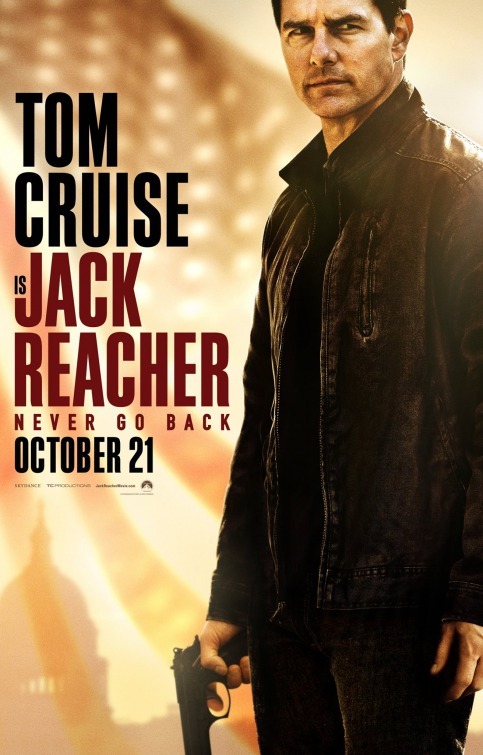 Never Go Back finds Jack Reacher (Cruise) traveling to Washington D.C. to meet up with Major Susan Turner (Smulders), who he has been talking to recently, and someone who has taken over his old unit. However, when Reacher finally reaches D.C. he finds out that Turner has been arrested for espionage, but something doesn’t feel right to Reacher and he decides to get to the bottom of it. To make things worse, Reacher finds out that there is a paternity suit against him and that he has a 15-year-old daughter named Samantha (Yarosh). Tom Cruise really wants another franchise, and Jack Reacher could have been it if Never Go Back wasn’t such a mess. Cruise nails the no nonsense, tough guy one-liners, but having Reacher become a potential father doesn’t really fit the character, and at times, slows the movie down trying to make awkward situations where Reacher has to act like a father to Sam – and in some cases have Turner act as a mother. Some of the scenes are funny, but feel out of place next to the Reacher breaking nameless thugs’ bones, and a hitman named The Hunter (Heusinger) killing people that stand in his way. I’m all for shaking a character up, but we’ve only had one movie with Reacher, and the first one had him as this unstoppable hitting machine that gets the job done. He’s like that here too, but it seems like he’s more tamed down this time around. There is a little more action this time around, although there’s nothing that compares to the chase scene in the first film. The new cast is a nice addition. Cobie Smulders does the best she can with what they give her, but I kind of wished she was more important to the overall plot. Danika Yarosh as Sam, Reacher’s possible daughter, holds her own with Cruise and Smulders, but she’s sometimes left with being the person that it told to stay back or having to be saved. Patrick Heusinger’s The Hunter is an okay villain, when he’s actually being a villain, and Robert Knepper is severely underused. All in all, Jack Reacher: Never Go Back is an okay movie that happens to be a sequel. Not saying the potential franchise can’t come back, but Never Go Back was a step backwards for the character. Synopsis: A group of people trying to cross the border from Mexico into the United States encounter a man who has taken border patrol duties into his own racist hands. Directed by Jonas Cuaron, the son of Alfonso Cuaron (Children of Men, Gravity), Desierto is a timely film about the border of Mexico and the U.S., and while Cuaron does understand the material and issue, he rather follow the dangerous cat-and-mouse game between our leads. It’s not so much a bad thing, but Cuaron is still learning his footing in the directing game. It should also be noted that the names of the characters are never said in the film – only in the credits. 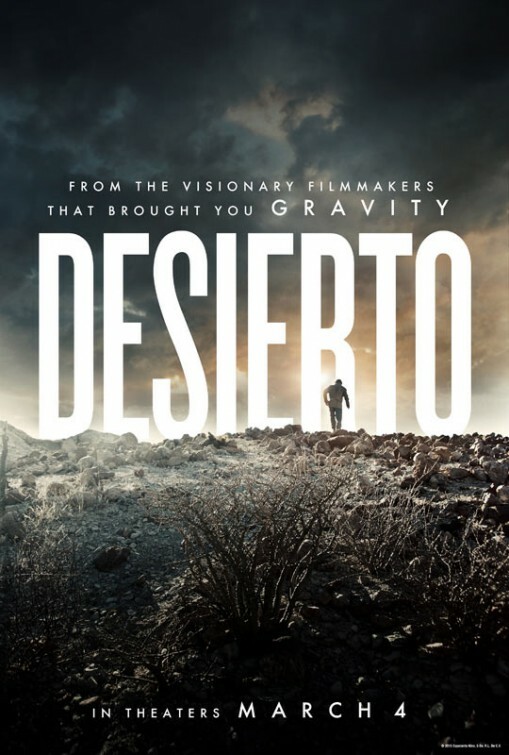 Desierto follows a Mexican man, named Moises in the credits, played by Gael Garcia Bernal, who along with a group of Mexican immigrants are coming to cross the border illegally. When the truck they’re in breaks down, they are left to walk the rest of the way in the desert. However, they aren’t alone as a man, named Sam in the credits, played by Jeffrey Dead Morgan finds them and kills most of the group. Moises, along with a few others, are left to survive in the desert against Sam and his dog Tracker. The film is one of the ultimate cat-and-mouse game films. The majority of the film is Sam chasing down Moises through the desert, which of course, adds a lot of tension since there is not a lot of places to hide there. It’s a hell of a lot harder when you also have a tracking dog and a madman with a rifle chasing you down. The film works best when it’s a thriller of the characters on the run, but it’s once it slows down is when the film starts to show its faults. It’s not hard to see the political themes, especially this late in the political season. Sam’s truck even has a small confederate flag and once he kills the first group of people he sarcastically says “welcome to the land of the free.” It’s not a bad thing, but Cuaron never fully develops that idea, and chooses to focus on the chase instead. When it comes the cast, Gael Garcia Bernal and Jeffrey Dead Morgan fully invest in their characters. Jeffrey Dean Morgan doesn’t go over-the-top like he could have, but he also doesn’t see what he’s doing as wrong. In fact he barely flinches when killing the characters from far away. Gael Garcia Bernal, on the other hand, plays his character pretty straight. He’s trying to survive to make it to his kids, and does something in the film that I didn’t think the film would do. The only other character that gets some more depth is Alondra Hidalgo’s Adela. The film does lose some steam near the end during the final confrontation between Moises and Sam because Cuaron wanted to keep the camera rolling. I’m not saying it wasn’t bad, but this is what separates him and his father in the director’s category. Although, not many directors are Alfonso Cuaron. All in all, Desierto isn’t a bad film, but it works better when it’s a cat-and-mouse thriller rather than being a cat-and-mouse political undertone thriller. While Gael Garcia Bernal and Jeffrey Dean Morgan are on point with their roles, the overall film lacks a certain punch to put it over the top. Synopsis: When Jake discovers clues to a mystery that stretches across time, he finds Miss Peregrine’s Home for Peculiar Children. But the danger deepens after he gets to know the residents and learns about their special powers. Based on the novel written by Ransom Riggs – which I haven’t read yet – and directed by Tim Burton, Miss Peregrine’s Home for Peculiar Children was a movie I was actually looking forward to despite it being directed by Tim Burton. I haven’t been a fan of Burton’s for a while, but it looks like he was returning to form with his X-Men-esque fantasy tale. Also, having never read the book, I’m judging the movie for the movie itself, and not how loyal the film is to the book. The film follows Jake (Butterfield), who is living in Florida, and wants to do something more in his life. That just happens when his grandfather, Abe (Stamp), passes away supernaturally. Remembering some stories as a child, Jake convinces his reluctant father (O’Dowd) to go to Wales so Jake can get closure on his grandfather’s passing, and maybe find out what really happening, all the while remembering the stories of his grandfather about a woman he once knew called Miss Peregrine (Green). 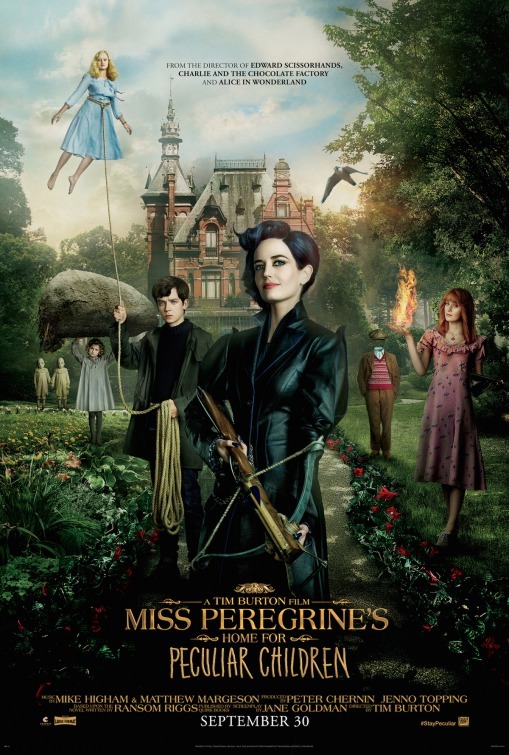 Eventually Jake finds out the stories of his grandfather are not stories at all, and finds Miss Peregrine’s Home for Peculiar Children that has children with powers of invisibly, floatation, pryokinesis, and other peculiarities. However, Jake finds out that all of them are stuck in September 3rd, 1943. Worse of all, dangerous monsters – known as Hallows – are after them lead by Mr. Barron (Jackson). The film works best when the fanatical elements are in full swing. When Jake direst arrives at the home and meets everyone, the film is fun. We get to see everyone uses their abilities. Ella Purnell’s Emma is the one we get to know the most as she and Jake spend the most time together, her peculiarity is air and being able to float off the ground. We also meet Olive (McCrostie), who can turn into anything she touches into fire, Hugh (Parker) who is always invisible, Enoch (MacMillan) who has an interesting ability that leads to a surprising and cool sequence near the end of the film. There are twins, Claire (Raffiella Chapman) has a mouth on the back of her head, Horace (Hayden Keeler-Stone) can project his dreams, Fiona (Georgia Pemberton) can manipulate nature, and Bronwyn (Pixie Davies) is super strong. It did seem like Miss Peregrine was tailor-made for Burton, and Burton does his usual thing and makes sure that the whimsy never fully gets put in the background. When the film does go off the fantasy element is when the film slows down a bit, but that rarely happens in the film. However, the film does get lost in itself for a bit, which is prone to happen when you have a lot going on. There’s even one plot point bought up that gets completely forgotten about once it’s introduced. The cast does a great job with everything they were asked to do. Butterfield’s Jake does have a peculiarity that makes sense for the film, and one that makes the film rather suspenseful at one point. Eva Green as Miss Peregrine is great to watch. Green brings a levity and grand approach to the children’s guardian. Samuel L. Jackson’s Barron character is, well, Samuel L. Jackson playing a bad guy – minus the swearing. His character is a bit too cheesy at times and just a smidge over-the-top. Judi Dench, Rupert Everett, Chris O’Dowd, and Allison Janney pop in for small roles that don’t really do too much in the film. One casting I couldn’t get over is Kim Dickens, who appears in literally two very short scenes as Jake’s mother. All in all, Miss Peregrine’s Home for Peculiar Children is one of the better Tim Burton films in the recent years. While the film does have some things wrong with it, the cast and whimsy of it all will keep you invested until the end. Synopsis: In 1965 Los Angeles, a widowed mother and her two daughters add a new stunt to bolster their séance scam business and unwittingly invite authentic evil into their home. When the youngest daughter is overtaken by a merciless spirit, the family confronts unthinkable fears to save her and send her possessor back to the other side. A sequel/prequel to the 2014 film, Ouija – which I never saw by the way, and kind of have no intention on seeing to be honest – Origin of Evil, is just that, an origin of the evil Ouija board that causes mayhem to the people that used it. 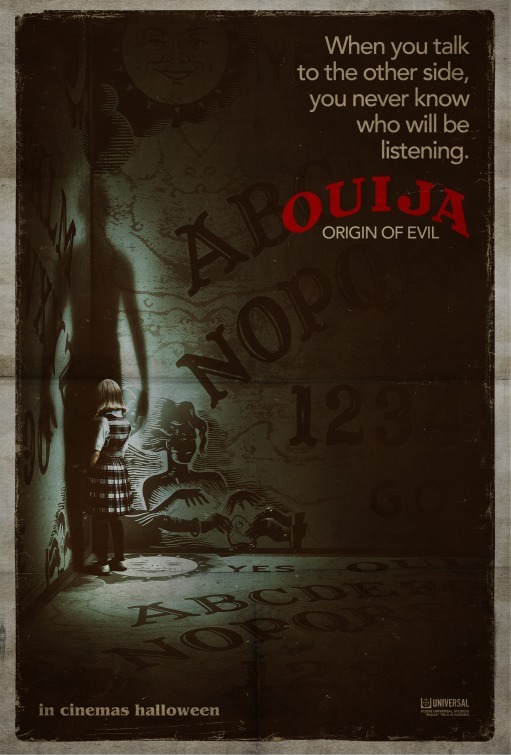 Ouija: Origin of Evil, set in Los Angeles in 1965, it follows the Zander family in mother Alice (Reaser), eldest daughter Lina (Basso) and youngest daughter Doris (Wilson), who run séance scam, but Alice does think she’s doing good by helping people, even if it’s not really true. Desperate for money, the family adds an Ouija board to shake things up. However, when Doris starts using the board more, strange things start to happen around the family, and eventually the family finds out that Doris has made contact with actual spirits – and they aren’t happy. Never seeing the first film (although I read what the connection was afterwards), I can only judge the film for what it was, and in part I really enjoyed the film. Origin of Evil keeps a great deal of the focus on the family, making us really care for these characters, and when everything goes to hell at the end, you do feel worried for them. It also helps that the actresses are great, but the highlight and real star of the film is Lulu Wilson, who plays Doris. One scene in particular stands out where the focus is on her and talks about a certain subject that really sticks with you, and despite the subject, I couldn’t help but laugh because it was so uneasy to hear her talk about it. The film does have some missteps, like a subplot with Henry Thomas’ character Father Tom. The subplot doesn’t really lead anywhere, and while it gives Elizabeth Reaser’s Alice more screen time, it felt shoehorned in. The other thing is the Ouija board. The board, while a huge and really only reason the events of the film takes place, is just hanging out in the background. The film could have probably done without the Ouija board and found a way to introduce the spirits another way. All in all, Ouija: Origin of Evil handles itself pretty well, as a horror film that also has a solid family story holding it together. While I may not have understood some of the little things that may connect it to the first film, I still really enjoyed it for what it was. This entry was posted in Movie Review, Movies, Review and tagged 2016, Action, Adaptation, Adventure, Aldis Hodge, Allison Janney, Annalise Basso, Asa Butterfield, Chris O'Dowd, Cobie Smulders, Comedy, Danika Yarosh, Desierto, Drama, Edward Zwick, Elizabeth Reaser, Ella Purnell, Eva Green, Fantasy, Finlay MacMillan, Gael Garcia Bernal, Gal Gadot, Henry Thomas, Horror, Isla Fisher, Jack Reacher, Jack Reacher: Never Go Back, Jane Goldman, Jeffrey Dean Morgan, Jon Hamm, Jonas Cuaron, Judi Dench, Keeping Up with the Joneses, Lauren McCrostie, Lulu Wilson, Mike Flanagan, Mini-Review, Miss Peregrine's Home for Peculiar Children, Movies, Ouija, Ouija: Origin of Evil, Parker Mack, Patrick Heusinger, Prequel, Reviews, Rupert Everett, Samuel L. Jackson, Sequel, Terence Stamp, thriller, Tim Burton, Tom Cruise, Zach Galifianakis. Bookmark the permalink.